The year 2012 | Africa, Europe, Russia / Siberia! Well done KLR! ← When I see my KLR I think of rhinos. I feel excited. As I have many German friends following the blog I am going to share with you in English. There are many indicators pointing to a very exciting year 2012. One is that most probably I will hit the road again end of May, beginning of June. My destination? Wait and see. That will be the realisation of a life-long dream. The KLR is doing fine, will have more than 83 000 km on the clock after the weekend. This weekend will be again one of far riding, clocking up km’s, touching up riding skills in … mud. Anne, do you remember our muddy trip a few years ago? That is where we are heading. Hope to have good photographs after the weekend. It does not happen often that I make an error in my “judgement” (wrong word, I know) of people. Recently it did happen and I had to apologize. In South Africa there is a lady, Jolandie Rust, who excelled in long distance cycling. 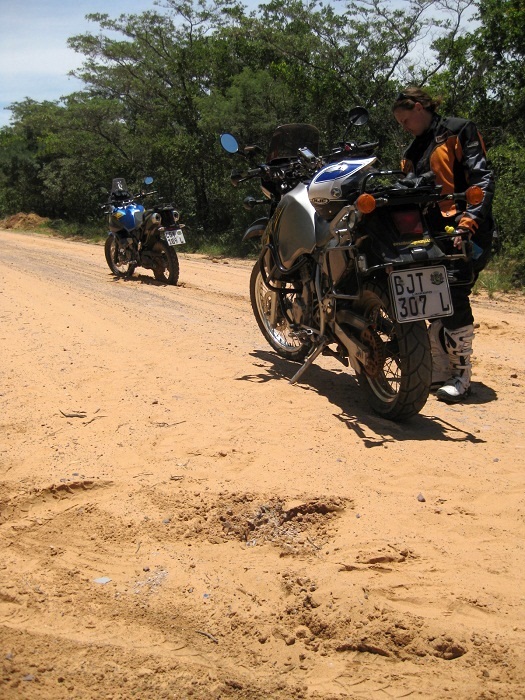 Among many achievements was her solo ride around South Africa. During April 2011 she left South Africa on her bicycle to circumnavigate Africa, alone. In northern Angola she was attacked by four panga-yielding men and robbed of everything. She had to return to South Africa. That didn’t deter her. She decided to try it again, this time on a motorbike. That is how we got to know each other. She selected a KLR (it was really her own choice) and started her riding practices. She made an appointment to come to Naboom, and I wasn’t in the mood for her. I don’t like glamour poopsies with a bit of air around them. Quite moerig (German people, it means bei schlechter Laune) I awaited her arrival here in the bushveld. Of course she wasn’t on time, and as I sent her an sms telling her I am leaving, I received a call from here. The KLR had broken down on the N1! Good friends Willie and Cathy Beukes came to her rescue with a trailer and cold water. And that is where I had to take back every word I said and thought about her. She is a very, very gutsy lady, humble, and I was so wrong. When she crashed my KLR last weekend I didn’t even kill her. I learnt that one must never point at bluewildbeest while riding in sand. The logic result would be a crash. Look at all the pieces of mirror in the foreground. I’m thrilled to announce that the debut screenings of ‘Saving Rhino Phila’ will be aired on eNews, channel 403, on Saturday 3 Dec @09h00, Sunday 4 Dec @15h00 and Monday 5 Dec @15h00. We all worked really hard to make this into a really intriguing documentary that would enlighten a global audience to the plight of our beleaguered rhino population, and we’re very proud of our end result. This is only the first step – the film is intended for international broadcast as soon as possible. I would like to take the opportunity to thank each and everybody for the support I had with the rhinos during the last 18 months which was extremely difficult at times. At time you kept me going when I wanted to throw in the towel. A special thank you to Andre Snyman who were there for Phila and me 3 hours after the last shot was fired at Phila. When I didn’t know which direction or where to go he was there day or night to listen to my plea for Phila. Niel my husband and family thank you for your patience and support. I know it was very hard for them as they did not always know where I was or what I am doing. Phila I have learned so much from you girl and you were the beginning for hope to many rhinos.